What’s not to love about chocolate? It has been used to worship gods, win political favor and woo loved ones for years – so today we celebrate chocolate and our craving for this indulgent treat. 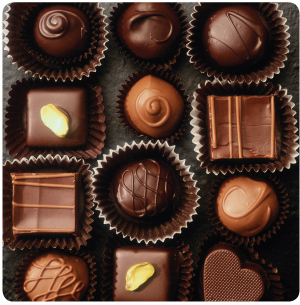 Chocolate was first discovered 2,000 years ago by the ancient Mayan and Aztec cultures of Central and South America. It originated as a spicy, frothy drink made from the ground seeds of the cacao tree and special seasonings. The word chocolate originated from the Aztec word, Xocolatl, meaning “bitter water,” as cacao beans taste bitter in their natural state. These beans became so valuable that they were actually used as currency which pre-dates the cliché – money doesn’t grow on trees. It wasn’t until the Spanish conquistadors and explorers, including Christopher Columbus, took the seeds home to Spain and made additional recipes, that the drink’s popularity grew throughout Europe. Famed Spanish explorer, Hernan Cortes, praised chocolate, once calling it “the divine drink which builds up resistance and fights fatigue. A cup of this precious drink permits a man to walk for a whole day without food.” The texture and taste of chocolate has evolved over the centuries, making it one of the world’s favorite flavors. Switzerland is among the top countries when it comes to chocolate consumption. The Swiss eat roughly 22 lbs of chocolate per person per year. The U.S. consumes about 11 lbs per person each year. Eating chocolate makes you happy because it contains phenylephylamine – the same hormone the brain triggers when you fall in love. Recent reports have found that chocolate may help lower your cholesterol level and reduce the risk of heart disease. Hershey’s, built in Pennsylvania in 1871, is the oldest and largest chocolate company in the U.S. The most expensive chocolate in the world is a $250 creation, called the Madeleine, by Fritz Knipschildt of Knipschildt Chocolatier in South Norwalk, Connecticut. The Madeleine is a specially, handmade dark chocolate truffle complete with a rich ganache, cocoa dusting, and a French truffle inside. Chocolate is associated with the release of serotonin, the hormone that makes you feel relaxed, calm, and happy. Women crave chocolate more than men. In America, 71% of consumers favor milk chocolate over other variants. Chocolate melts in your mouth because its cocoa butter component has a melting point slightly below the human body’s average temperature.